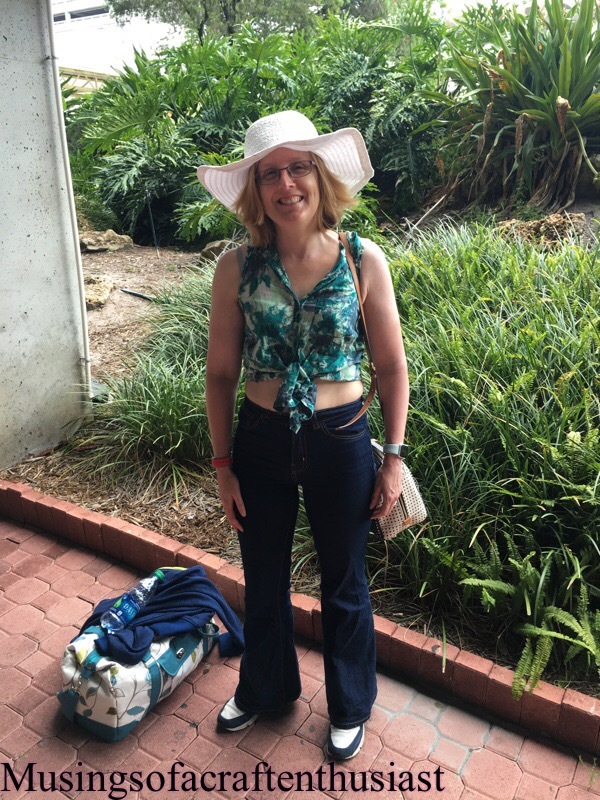 Hi, I’m on my third pair of Birken Flares, I still love the pattern and they are so comfortable, the first pair I made from a cheap 10oz Denim from eBay this is quite a light weight but it holds it’s shape over multiple wears. I bought the black, it has faded to a charcoal grey but for the price, fantastic. The second pair is a heavier weight denim and better quality, I thought but after 2 wears max has to go back in the wash. This pair (third) I went back to my trusty man on eBay and bought the dark blue denim he had advertised with the black. I bought 3 meters out of which I cut two pairs of jeans and my skirt blogged about here so far I have only had time to put one pair together, I was stitching them at the same time but with different coloured top stitching, once I started confusing my self I decided against it. This pair has yellow top stitching and came together pretty quickly, I did have a problem with the fly top stitching and the crotch but otherwise it went together with no problems, I do have one confession to make though I still haven’t tried rivets yet, I’m quite happy banging in the one button and yanking the extra teeth off the zip, but to be honest the rivets scare my some what. Maybe next time. Hi, I’m having a busy year so far, I’ve made a lot of things but not finished them, if you read this blog I think that you will find this is a recurring theme, However I do have something to show you that is finished. 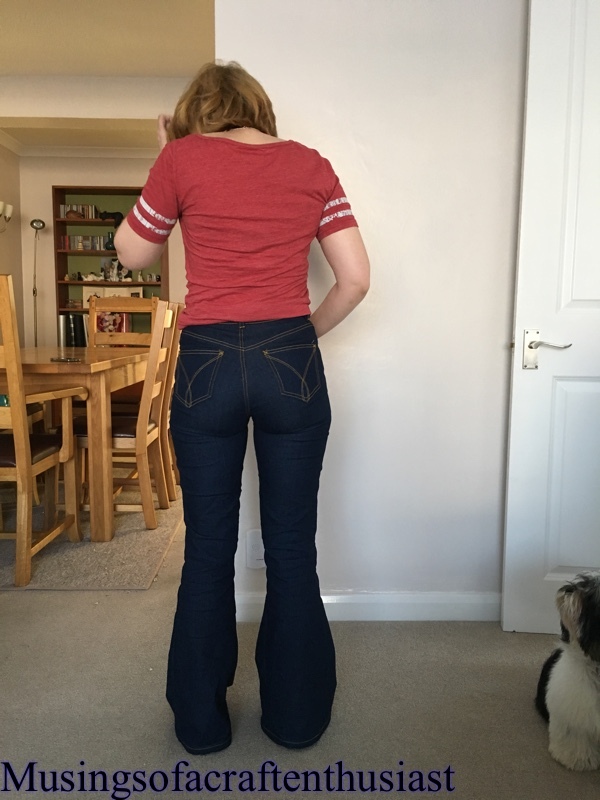 My first pair of Jeans, and they look lovely, I cheated top-stitching wise, my fabric is Black and so is my top-stitching but never fear I’ve started on a new pair which are dark blue with red top stitching, a photo at the end of this post. I do have two sewing machines which make assembling this pattern a lot easier, my usual machine is set up with the normal thread and my older machine with the Top-stitching thread. 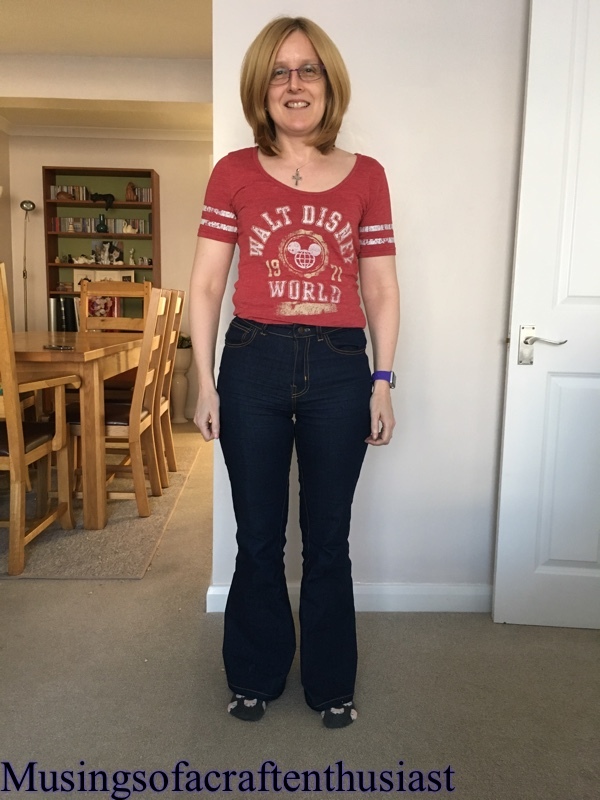 I bought the fabric from eBay, it was the cheapest 10 oz denim I could find, when it arrived, I wasn’t too sure about it, it was quite stiff, but after washing it, the fabric softened up a lot. This is the first PDF pattern that I have downloaded that you can pick which sizes to download, this is genius everyone should do it. It makes it easier to to grade between sizes and you don’t get all the confusing bits where all sizes congregate in one spot. I printed 26 and 27, in the end I just made a straight 26, I took 3 1/2 inches out of the length, looking at the sizes I should have taken out 4 inches but I’d rather they were too long after the next wash than too short. With shop bought jeans I sometimes find they keep shrinking into the second and third washes. 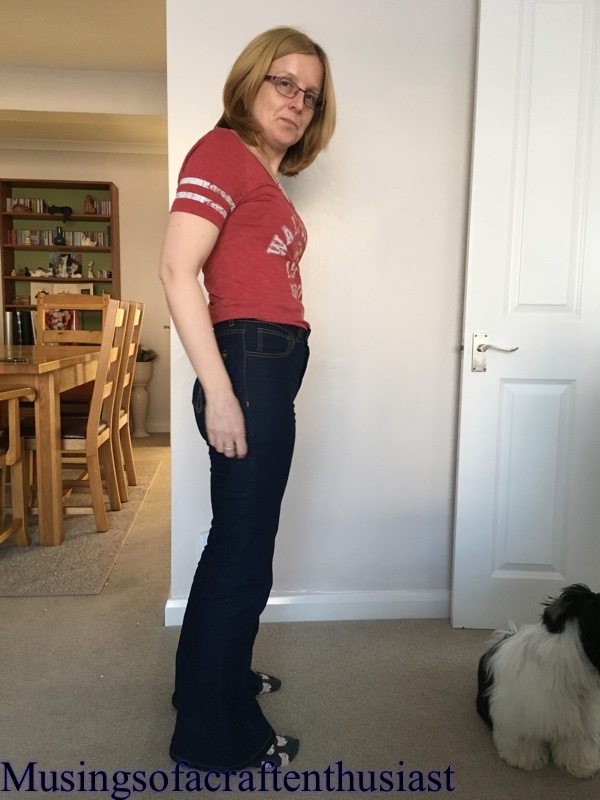 The instructions were brilliant and I would say that as long as you know your way round a sewing machine, you should have no trouble making a pair of jeans whatever your skill level. The fabric is a lot blacker than it looks here, but at least the highlights are showing off the stitching. after this you start working on the fly, I would say that the instructions for this is better than the instructions for the Sewaholic Thurlows, but it does use a lot more photos. one thing this fabric does do is attract the cat hair :-(, here are some photos of the front made up. I am very pleased at how they have turned out, the only bit I am slightly disappointed in myself is that there is a tiny bit of pocket lining showing on the curve of the pockets, but that’s what a black sharpie is for. As promised a shot of the pair I am working on now. I decided against patterning the pocket as I thought it might be too much red, but now I sort of wished I had. I used a different foot for the top-stitching the first one was done with a 1/4 inch quilting foot the second pair of jeans I decided to use the stitch guide foot, which I’m finding a lot more accurate.